APMdigest is an online authority in the Application Performance Management (APM) technology market, and it is the industry's only online publication focused specifically on APM. The goal of APMdigest is to bring the industry together by providing a platform for thought leaders such as analysts, consultants, vendors and users. As our sponsors help us meet this objective, they also gain the advantages of market exposure, brand awareness, lead generation and thought leadership. A recent Platinum ad on APMdigest rec'd 5800+ clicks in 5 months. While APMdigest cannot guarantee that level of performance for every ad — since the performance is based on a variety of factors — it shows the potential is there. APMdigest's prestigious list of sponsors includes APM industry giants CA Technologies and IBM. - Sponsor blog priority posting in the next available spot. Even though APMdigest has a queue of blogs waiting to be posted that can sometimes be as long as several weeks, sponsor blogs get priority and are posted asap, usually within a couple days. - At the end of any sponsorship, if the sponsorship is not renewed, all ads; assets such as white papers, webinars and free tools; ads and links embedded in blogs and industry news; and all links on the APM Buyers Guide will be taken down. - Sponsorship of APMdigest does not include sponsorship of APM Academy. Ads only appear on APMdigest pages including the APM Buyers Guide, but do not appear on APM Academy pages. - If a sponsor's company name or branding changes during a sponsorship, APMdigest will take down any outdated ads, assets and logos. The sponsor is responsible for providing APMdigest with new ads, assets and logo corresponding to the changes. APMdigest offers 3 levels of sponsorship: Platinum, Gold and Silver. Platinum is APMdigest's premier level of sponsorship, providing a banner ad in a unique and highly visible space on every page of the site - not including APM Academy. Platinum Sponsors get a Platinum ad, Gold ad and Silver ad. Platinum Sponsors can post unlimited webinars, white papers, free tools and trials, and open an unlimited number of blogging accounts. Platinum Sponsors can also post an unlimited number of featured products and case studies on the APM Buyers Guide. APMdigest offers a limited number of Platinum Sponsorships. Contact Pete Goldin for more details. The Gold Sponsor is the main sponsorship of APMdigest, providing high visibility. This tier involves placement of a large ad in the center of the site directly above the featured content. Two Gold Sponsor ads are displayed at any one time, and they rotate with each click so that each Gold Sponsor ad has a chance to be a focal point of the page. The large ad also appears in the center of the page in the bi-monthly APMdigest emails. Gold Sponsors also get a Silver ad in the right column of the site. Gold Sponsors can post up to 8 white papers and webinars per month, 4 per each email. 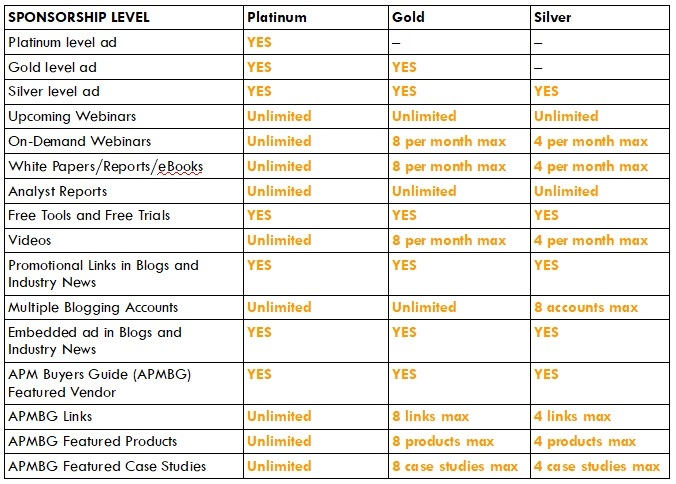 Gold Sponsors are also eligible for an unlimited number blogging accounts on the APMdigest Vendor Forum. - Featured Vendor status, with a direct link from the left column nav bar to your directory page. - Up to 5 featured products on your directory page. Featured products also appear on the APM Buyers Guide home page - 10 at a time, rotating with each click. - Up to 3 case studies on your directory page. Case studies also appear on the APM Buyers Guide home page - 10 at a time, rotating with each click. - Up to 8 links on your directory page. - Your company logo on your directory page. - Your Gold ad will appear on your directory page. Gold sponsorships are available in 3-month and 12-month commitments. Contact Pete Goldin for rates. Silver is the entry level sponsorship, providing companies with an economical option to gain a presence on APMdigest. If your primary goal is ad clicks, APMdigest recommends the Gold or Platinum sponsorship levels which typically get higher ad clicks than the Silver level ads. If you have a limited budget, and are more interested in gaining brand visibility, and posting your white papers, webinars, free tools and other links on APMdigest, then a Silver Sponsorship is the right choice for you. Silver Sponsors receive a medium sized ad in the right margin on every web page - not including APM Academy - and in the bi-monthly APMdigest emails. Silver Sponsors can post up to 4 white papers and webinars per month, 2 per each email. Silver Sponsors are also eligible for up to 8 blogging accounts on the APMdigest Vendor Forum. - Up to 2 featured products on your directory page. Featured products also appear on the APM Buyers Guide home page - 10 at a time, rotating with each click. - 1 case study on your directory page. Case studies also appear on the APM Buyers Guide home page - 10 at a time, rotating with each click. - Up to 4 links on your directory page. - Your Silver ad will appear on your directory page. Silver sponsorships are available in 3-month and 12-month commitments. Contact Pete Goldin for rates. The chart below allows you to easily see the differences in benefits between each sponsorship level.